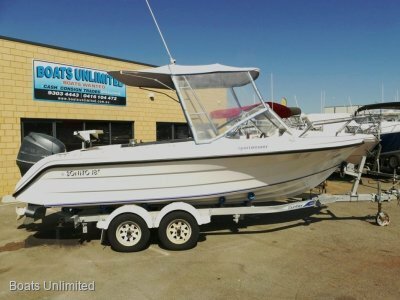 Welcome to Boats Unlimited Established in 2004 we have been running our own very successful business for more than 12 years. Karl Richardson has been selling boats for over 20 years and with more than 3000 sea trials under his belt there are very few combinations of boat and motor, which he does not have a historical perspective on. 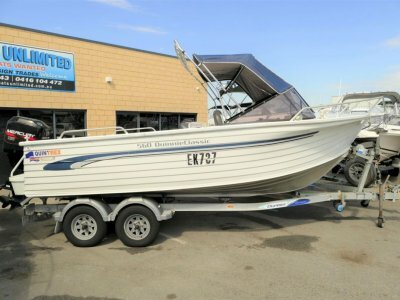 We are essentially a family owned and operated business, with a passion for boating and especially fishing. We have 2 kids and very much enjoy getting out on the water. We are happy to provide free technical advice. We have an excellent reputation in the market place which we are very proud of and continue to strive to keep it that way. We tend to specialise in Family Fishing All Rounders. We aim to keep between 30 and 50 boats in stock at any one time, which makes us the largest second hand only yard in Western Australia. There are a number of reasons why we think we can help you either buy the right boat or sell your boat. As we are very proud of our reputation, we work as mediators between the buyer and the seller. We thrive on repeat business, from both our purchasers and sellers. We have lower overheads, than our competitors as we own our own premises, so we don’t need to put higher mark-ups on our products. We don’t sell new, so we won’t take potential purchasers away from your second hand boat and try to up sell them onto new. We don’t have a work shop so we don’t need to find problems to keep the workshop busy. We have a bitumised yard, so your boats won’t get so dirty and they are washed regularly. We have great security with security fencing and motion detection beams and 24 hour camera surveillance. We work 6 days a week and operate after hours by appointment. We try to be accurate with pricing your consignment boat before you bring it in, to help get a quicker sale. We have an elevated yard overlooking Hartman Drive which has a high traffic flow, including both the new Masters store and BMW store. We sell over 110 boats each year, which is why we always need more stock. We also have a large equity account so we can buy your boats outright and also take trade ins, which many other yards will not do. We can offer finance, which is often more difficult to get on private sales. We are Club Marine agents and can offer both insurance and boat valuations. “We may not have a boat to suit you today, however if we treat you right, you will tell others”. So why not come in and say hello and see for yourself!